With a stay at Mounts Bay Waters Apartment Hotel, you'll be centrally located in Perth, a 7-minute walk from Perth Convention Exhibition Centre (PCEC) and 10 minutes by foot from Perth Parliament House. This 4-star apartment is 0.8 mi (1.3 km) from Jacobs Ladder and 0.9 mi (1.4 km) from Rio Tinto Naturescape Kings Park. Make yourself at home in one of the 139 air-conditioned rooms featuring kitchens with refrigerators and stovetops. Rooms have private balconies. Cable programming and DVD players are provided for your entertainment, while complimentary wireless Internet access keeps you connected. Conveniences include phones, as well as safes and desks. Dip into one of the 2 outdoor swimming pools or enjoy other recreational amenities including outdoor tennis courts and a fitness center. Satisfy your appetite for dinner at Courtside Restaurant, a restaurant which specializes in local cuisine, or stay in and take advantage of the room service (during limited hours). Continental breakfasts are served on weekdays from 6:30 AM to 10:00 AM and on weekends from 7:30 AM to 11:00 AM for a fee. 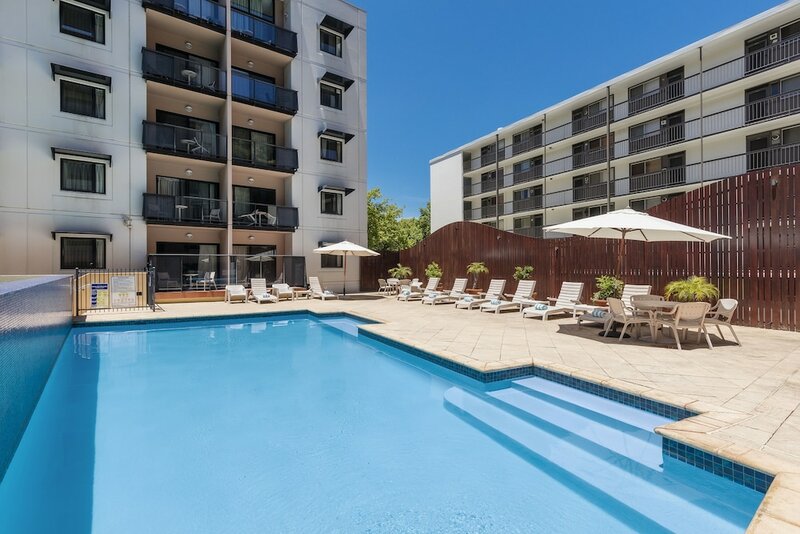 Mounts Bay Waters Apartment Hotel features 2 outdoor swimming pools, outdoor tennis courts, and a fitness center. The apartment offers a restaurant. This 4-star property offers access to a 24-hour business center. This business-friendly apartment also offers tour/ticket assistance, multilingual staff, and a garden. Onsite self parking is complimentary. Mounts Bay Waters Apartment Hotel is a smoke-free property. Continental breakfasts are available for a surcharge on weekdays between 6:30 AM and 10:00 AM and on weekends between 7:30 AM and 11:00 AM. Courtside Restaurant - This restaurant specializes in local cuisine and serves breakfast and dinner. A children's menu is available. Open select days. 2 outdoor swimming pools are on site along with outdoor tennis courts and a fitness center. Rollaway/extra beds are available for AUD 51.0 per night. Free WiFi is limited, per day. A surcharge applies for additional usage. For more details, please contact the property using the information on the reservation confirmation received after booking.